Davenport, Iowa; 2 January 1925. Courtesy of Kelly Collins. 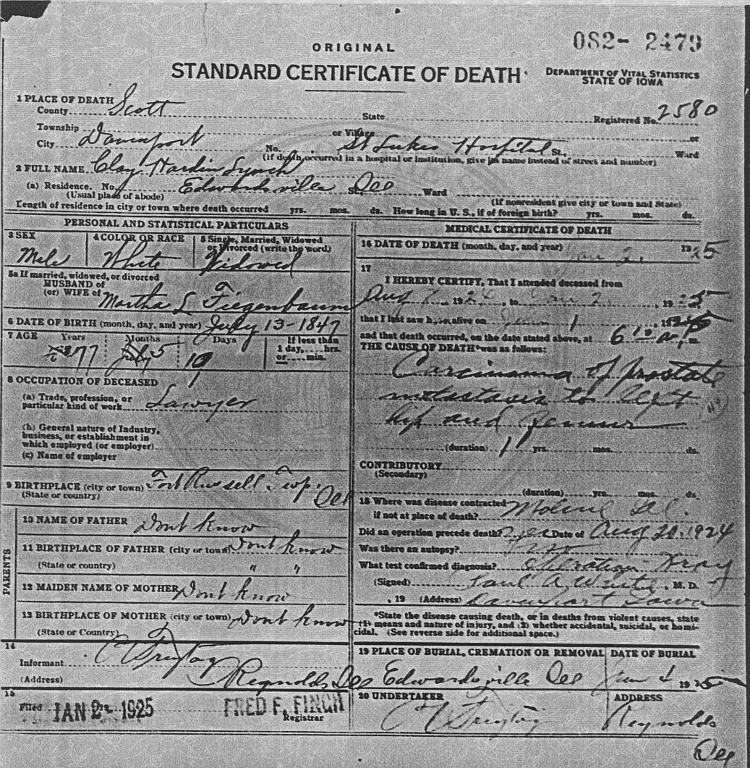 Death certificate for Clay Hardin Lynch. According to the death certificate, Clay Hardin Lynch, a resident of Edwardsville, Illinois, died on 2 January 1925 at 6:10 a.m. at St. Luke's Hospital, Davenport, Scott County, Iowa. Paul M. White, M.D., of Davenport, Iowa, had attended Clay Lynch from 7 August 1924 until 2 January 1925 and had last seen him alive on 1 January 1925. Dr. White determined by observation and x-ray (there was no autopsy) that the cause of death was "carcinoma of prostate; metastasis to left hip and femur;" a condition of one year's duration. The disease had been contracted at Moline, Illinois and the deceased had undergone an operation on 20 August 1924. The undertaker, C. [?]. [Freytag? ], of Reynolds, Illinois, noted that burial was to take place at Edwardsville, Illinois on 4 January 1925. The undertaker also provided the Personal and Statistical Particulars for the death certificate. According to the document, Clay Hardin Lynch was a white male who had been born on 13 July 1847 in Fort Russell Township, Illinois. The undertaker did not know the names or birth places of Clay's parents. Clay had been a lawyer. He had been married to Martha L. Fiegenbaum, but was a widower at the time of his death. The undertaker calculated that Clay had died at the age of 77 years, 5 months, 10 days. However, given the date of birth provided on the deathe certificate, the calculated age is short by about 10 days. The exact date of Clay's birth is not certain. According to information recorded on his marriage license in May 1884, he would have been born about 1847-1848. The undertaker supplied the date of 13 July 1847 for Clay's death certificate. The birth date inscribed on Clay's gravestone is 14 June 1846. And finally, his brother-in-law, Dr. Edward William Fiegenbaum, in a May 1925 response to the Alumni Office of the University of Michigan, reported that Clay had died at the age of 79 years, which would calculate to a birth from about January 1845 to January 1846. A resolution of this matter will require further research.